Thomas Browne made lantern clocks in Bristol in the third quarter of the seventeenth century. Technically he was not the first clockmaker known to have worked in Bristol - I mean the first by whom work survives, not just the oldest name of a clockmaker taken from old records. The first was Solomon Wasson, who took up his freedom to trade in Bristol in January 1643 and worked till at least 1676, though he probably spent some of that period working in London. Wasson's background is uncertain but certain clues suggest he was born locally at Chewton Mendip in Somerset and was trained in London where he is also believed to have returned to work during at least part of his working life. Only a single lantern clock is known by Wasson, signed 'Solomon Wasson of Bristol'. 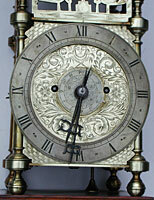 However apart from its signature it is in all other respects a London clock, perhaps not surprisingly, as the maker would have brought with him to Bristol his London training, work practices and style, and of course he would have kept in contact with London suppliers of blanks and castings. So the only clock by the oldest known Bristol clockmaker is a London clock in all but name. Of course it is possible that Wasson's clock could well date from a few years after 1643, which could mean that Thomas Browne might in fact have made the oldest clock known from Bristol. Thomas Browne was the son of a Bristol blacksmith and took up his freedom to trade in Bristol in November of that same year, 1643. Only one clock is known by him which is signed and those others attributed to him are done so on the basis of his style, which is uniquely distinctive. In total six clocks have now been recorded, which are ascribed to him, including the signed one. Four of these are illustrated in George White's mammoth book 'English Lantern Clocks', now itself so long out of print and so rare that a good second-hand copy can bring as much as a modest lantern clock. One of these is signed with the name of the first owner, John Kelson, and dated 1649. The fifth clock, probably the earliest of these five, is pictured in the catalogue of 'Early English Lantern Clocks' published by John Hooper and Bill Bruce in 2005. The sixth clock (converted later to a fusee movement) is pictured here and is probably earlier still, which would make it Thomas Browne's oldest known clock, dating from perhaps 1645. The fifth and sixth clocks each have features in common which suggest they pre-date the other four, principally in that they have round-based integral pillars. Thomas Browne worked till his death in 1680, but his surviving clocks seem to be from his earlier period - as far as we can tell in view of his antiquated style. Unfortunately this sixth clock was converted long ago to a double fusee English spring-driven eight-day movement, but nevertheless it tells us a great deal about the beginnings of Bristol clockmaking. Until very recent years fusee-conversion lantern clocks were scorned by collectors as being 'spoiled', but today we recognise that they can often still prove very informative. In some instances the only clock known to survive by a certain maker can prove to be a fusee conversion, without which we would not even have known of that clockmaker's existence, let alone have any inkling of the style or quality of his work. Thomas Browne originated a very distinctive and highly-recognisable style which is today seen as the beginning of the true 'Bristol' style of lantern clock. This as a style which was already old-fashioned when Browne began it, as he must have well known. In fact the reason Browne did not usually sign his clocks could also be a deliberately old-fashioned policy on his part, as the older clocks made in London, which he was copying, were very often unsigned. A few later clockmakers, who worked in Bristol, made clocks there in the style of London, as Solomon Wasson had done, perhaps because they came from London or were trained there. But the later local clockmakers (in Bristol city and a wide region around), who followed the Bristol style, all based their work ultimately on that of Thomas Browne. Some of those also left their clocks unsigned. Maybe by then it had become a local tradition. 1. Lantern clock attributed to Thomas Browne of Bristol c.1645, probably his earliest clock so far discovered. The dial sheet is made of brass, unlike his others which have copper dials. Converted later to spring drive. Note the round-based finials. The fret is an uncommon pattern. Click for closer view. 2. This dial became his standard pattern and was used as a basis by other makers in the area later. The comic face below XII appears on each of his clocks. This may be the first use of brickwork corner engraving, another feature taken up by others later. The London style was more than just a look. It also involved the construction. The pillars of the earliest London lantern clocks had been of two types - those we describe as 'composite' and others we call 'integral' or 'continuous'. A composite pillar had the finial and foot cast as separate units and screwed into place on assembly with the clock plates squeezed in between, like cheese in a sandwich. An integral pillar was one where the whole thing was cast in one piece complete with foot and finial; then the plates were inserted in a horizontal slot at the junction of pillar to foot/finial. Both integral and composite pillars were made from the earliest lantern clock making times in London, possibly in equal numbers. One very unusual version of the integral pillar was that where the finial/foot base was rounded in section rather than the usual square. This form of round-based integral pillar occurred only in the earliest London period and was very rare. I can count only five known examples in the published literature of clocks, the only signed one amongst them being by John Cattle. The rounded-base pillar was pretty well extinct in London by 1630 to 1635 (though there was one eccentric family in provincial Britain still using it) , leaving the square integral form alongside the composite pillar as the only two forms extant. By 1640, or shortly after, the integral pillar was no longer seen in London, other than in the work of an occasional eccentric such a Jeffrey Bayley, who kept that form regardless. When Thomas Browne began work his style was already antiquated in one particular respect in so far that he used the integral pillar, which by then (1643) was already all but extinct in main line London clockmaking, which was the major, and virtually only, centre of lantern clock making at this time. But not only did Browne use the integral pillar at a time when it was obsolete, but in his earliest two clocks (pictured here) he used the round-based form of that pillar, which was even more antiquated. His later clocks used the more usual form of square-based integral pillar - being, dare we say, slightly more 'modern', but still old-fashioned. However there was a tiny group of lantern clock makers in Salisbury, based largely on the work of one family named Snow, who also used integral pillars but of a different form, and who even occasionally used the round-based integral pillar. The Snows, though, were a bit of a law unto themselves as far as styling was concerned, and it is difficult to draw conclusions from their work other than as to its eccentric nature. So in that respect it is possible that Browne based his work either on London or on Salisbury, and arguments can be put forward for either, but whichever it was, the essential point is that this constructional style was already antiquated by 1643, and he well knew it. I would plump for London as his round-based integral pillars are very much like John Cattle's and his normal integral pillars receive the plates in a neater manner than do those by the Snows of Salisbury, and exactly as they did in London. Several of the features and practices he used can be seen to have been based on those of London, and there is no question but that he was familiar with London work. We don't know where Thomas Browne learned his trade, and it does not really matter. The fact that he used old-fashioned working practices must have been deliberate, because he cannot have been unaware of the constructional and stylistic features of the clocks made by his London-influenced rival Solomon Wasson, and of those of his London contemporaries - indeed in his oldest two clocks he was copying London round-based pillars. Yet he deliberately continued to use these antiquated practices by choice, presumably because he preferred them. What is important about the beginnings of Browne's integral-pillar construction style is that Bristol makers who succeeded him also used that same style, which became the style of the West Country in general, and we can only assume that Browne's followers also preferred this local style. So Thomas Browne's obstinately old-fashioned style set the pattern for over half a century of local clockmaking. It was not just in the construction of his clocks that Browne was contrarily old-fashioned. His engraved design was also old-fashioned by the time he began to use it, and this almost certainly was based on one of the designs used by the Snow family of Salisbury. The comic face below XII, which he used on each of his clocks, was probably taken from a similar idea used occasionally by earlier London makers. Each of Browne's six clocks has a virtually identical engraved pattern for the dial centre. A good few of the later Bristol and West Country clockmakers based their dial designs on that by Thomas Browne, sometimes going as far as to include the comic face. In the case of the first clock pictured here Browne used brickwork hatching for the dial corners - I think he was the first to do this. But that brickwork pattern theme was also used at times by one or two later West Country clockmakers. 3. The double fusee movement from the left. One interesting aspect of Browne's clocks is that his dial sheets are said to have been made of copper, not brass. I have not examined them all, but this does seem to be true with the exception of the earliest clock (the fusee conversion in plate 2), the dial of which is made of brass. Why he should have used copper is not known, as it seems not to have been a practice used by any other makers of lantern clocks. However I have seen one or two early longcase clocks from this area with dials made from copper - though later than Browne's work, of course. It is intriguing that what looks like his earliest clock has a brass dial and his later five all have copper ones. At the time he began making clocks the Civil War was raging. The need to preserve life and limb must have been uppermost in the minds of most people, and attempting to carry on any business must have been difficult to say the least. Not only was the safe transportation of commercial goods difficult if not impossible, but it is known that brass at this time was notoriously hard to obtain as all available supplies were seized by the two opposing armies to make cannon and all kind of armaments. Could it be that once brass supplies dried up he used copper because he could more readily obtain it? He was one of very few clockmakers who seem to have carried on working during the war. Thomas Browne engraved the surface of his doors, whereas the great majority of clockmakers left the doors plain. He was not the first to do that, but he probably was the first in any region to do it consistently and the first to use this particular sort of pattern, which has an arched doorway or window shown in a primitive perspective, with pillars at each side and a criss-cross pattern in front, believed to represent black-and-white floor tiling. Some of those West Country clockmakers who worked after Browne also engraved their side doors with patterns based on this concept, though the theme was varied a little. The chapter rings of Thomas Browne's clocks were exceptionally narrow and graceful - just as those had been of the earlier London clocks, some of whose features he copied. The slim chapter ring is another archaic feature of his clocks, and deliberately so. This means that his clocks have a grace about them, which is not found in some later London clocks. Browne also used the tiny 'floating' half-hour marker, rather like a star or asterisk, which too had been used on earlier period in London and was another deliberately antiquated feature of his style. But the narrow chapter ring was a feature copied by a good many later West Country makers too, who also took this aspect of Thomas Browne's work as being the ideal on which to base their own. The method by which the chapter ring and dial were attached to the movement on Thomas Browne's clocks was also one used in early London work and pretty well obsolete by 1643. By this time, as in Solomon Wasson's clock, the chapter ring was pinned to the dial on four chapter ring feet, and the dial was then pressed home to the frame and held in place by pins at its top. In earlier times the chapter ring had been pinned to the dial sheet by two dial feet at its base, but at the top a longer lug projected from the chapter ring through a rectangular hole in the dial sheet and reached in to pass through the front movement crossbar, where is was held by a pin. This long upper lug system was used by Thomas Browne long after it was extinct in London, and its use was continued by many subsequent clockmakers in Bristol. This lug and pin can just be seen in plate 12, and the rectangular hole is obvious in plates 4 and 5, even though this particular converted clock now has its chapter ring attached from the back by tiny screws. The fret on what is probably Thomas Browne's earliest clock (plate 3) is a very uncommon one and the only clock I can think of with this same fret is one by John Gilson of London dating from about 1620 to 1630. Gilson worked from 1610 to 1632. Browne was presumably using that fret as a model, and that too was an old-fashioned design by the mid 1640s. The conversion of the earliest clock to a ting-tang quarter double fusee eight-day bracket clock was done by William Page, 'West End Clock Manufacturer', Great Portland Street, London. The movement is very finely made and fitted, and Pages were so proud of the result that they engraved their name and address on the backplate and on the pendulum bob too, the latter being something I have never seen before. They worked there from 1856 to 1881. As lantern clocks became increasingly obsolete, more and more were destroyed. Some people today still regard the conversion to spring drive as a great shame. But it is probably only through the good fortune of so many having been converted, that ones such as this survive at all. Without that conversion we might never have been able to study the most interesting features of what is probably the earliest surviving clock by the earliest Bristol maker.